The Best Baby Beach Tent for the Summer! As great as sunshine is, it’s rays can be really harmful especially to the little ones. Our favorite way to get outside while keeping the babies protected from the sun has always been a baby beach tent. It’s something our family has done for a long time, although before it became a real “thing” we would just use a normal small tent.We had our pro moms check out the best baby beach tent and give you the breakdown of which ones truly are the best. We know that sunscreen for babies can be a choice that really tears you apart as a parent, since many pediatricians are opposed to its use. That is why a tent is a great compromise. It will provide great shade and keep them off the ground, which is really nice if your outing involves sand. Now that they’re so popular there are tons of great options that are easy to pop up and have special features to accommodate babies. Make sure to check them all out before your summer plans get underway! This will be super important because let’s face it, if it isn’t easy to set up it won’t actually ever get put up. That’s just how life is with kiddos around. The best choice to go with is a pop up. It will have the fewest pieces to deal with! I still remember my husband using quite a few choice words trying to pack back up the pop-up tent, so make sure to find one that is easy to pack back up. You want your baby to have ultimate protection from the sun. If you can find a tent that fits your needs and has ultraviolet protection, you’ve found a winner. Some tents just offer shade, which is still great. However, look for the certified ultraviolet protection label for the added bonus. You don’t want a flimsy tent that doesn’t stay put. Check to see if there’s stakes, sand pockets, or some sort of pegs to keep it on the ground. You will also want to make sure it is made of a sturdy material. Check to see if there are windows or sides that can be opened to let a little air in. Your little one wants some of that sea breeze too! Any ventilation will keep your tent from turning into a sauna inside. This one is really up to you and based on your needs. Some mamas might just need a tent for one baby, but others of you might need to fit a few more munchkins in there. It’s always great to have some extra room for everyone else to get a break from the sun. So, we had our pro moms try out different beach tents and here is a list of the creme of the crop. This playshade is most of our moms favorite and was consistently voted the best baby beach tent. It is great with its closed bottom to keep sand out, closable and open front with great air vents. Plus some stakes to keep it in the ground. It even comes with a little carrying case making it easy to tote on any adventures. This tent is also made of fabric with 50+ UV rated fabric, so it will protect your baby super well. Check Current Prices Here! This tent is great at is it super easy to put up and more importantly takedown. (My husband has no patience for putting back tents, so it’s a great feature for us) The tent is SPF 30 and is also well ventilated to keep your baby cool. Check Current Prices Here! This is our rookie moms squad’s favorite of the larger tents on the market. This pop up tent is HUGE definitely can fit a lot. Usually the advertising of 5 person capacity it is based on very small people. Not this one. It Is tricky to fold back up but they have a youtube video which once you watch a couple times makes it a whole lot easier. – Check Current Prices Here! The mesh siding surrounding this whole tent is one reason that we love this baby beach tent so much. It allows your little one to see out and take in all their surroundings. It’s three feet wide and three feet tall, leaving room for some siblings to join in. It isn’t pop up, but it is super easy to assemble. Another perk of this tent is that it’s very easy to wash off after a day of sand. Check Current Prices Here! 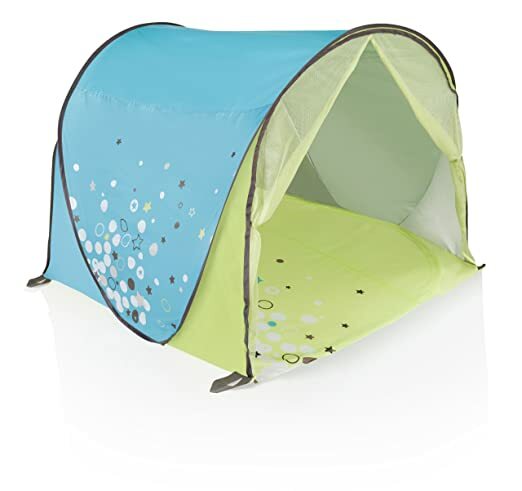 This tent is really popular among a lot of parents and you can see why because it comes in fun, bright colors! It has plenty of UV protection. Do make sure to put in the stakes though because it is pretty light and might just blow away without them. Check Current Prices Here! This is another family option, but it’s so reasonably priced it won’t cost you much more than a baby beach tent. The whole side unzips meaning your kiddos can play in the sand, but sit on the tent floor. It provides UPF 30+ to protect you from the sun. It is another pop up option, so you won’t have to worry much about assembly. Only downside is no floor to the tent so you will have to use your own towels or blanket to protect your little one from the sand. Check Current Prices Here! If you’re look for a spot that you know your baby will be safe in, this is a wonderful option. This little infant beach tent is like a mini porta crib. You can have it halfway or fully closed depending on how much shade you want your baby to have. You can be sure your baby will be comfy because the bedding is super padded, but they will also be super entertained with the cute windmill. Check Current Prices Here! This is the baby beach tent for you if you are looking to keep things simple. It’s just a little mat with a fish-shaped sun cover, which is adorable by the way! It folds really easily and has 50 UPF sun protection. Another bonus, it is definitely on the cheaper side. I love the sleek design of this tent. It is extremely light, pops up super easily, and folds up into a compact carrying case. It’s perfect for just one baby to fit inside. It is surrounded in mesh, keeping everything you want out outside but air can still flow through. There are side flaps that can be rolled up or down over the mesh if you would like to keep the sun out. Check Current Prices Here! Pin for Later – The Best Baby Beach Tent for the Summer!